Fruit tarts seem to be the one dessert that everyone can agree on– even self-proclaimed “not a dessert person”-people, so it’s always a safe bet. The beautiful fruit patterns also make a bright splash on the dining table, so I like to think it adds to the festivity and decor of the celebration as well. 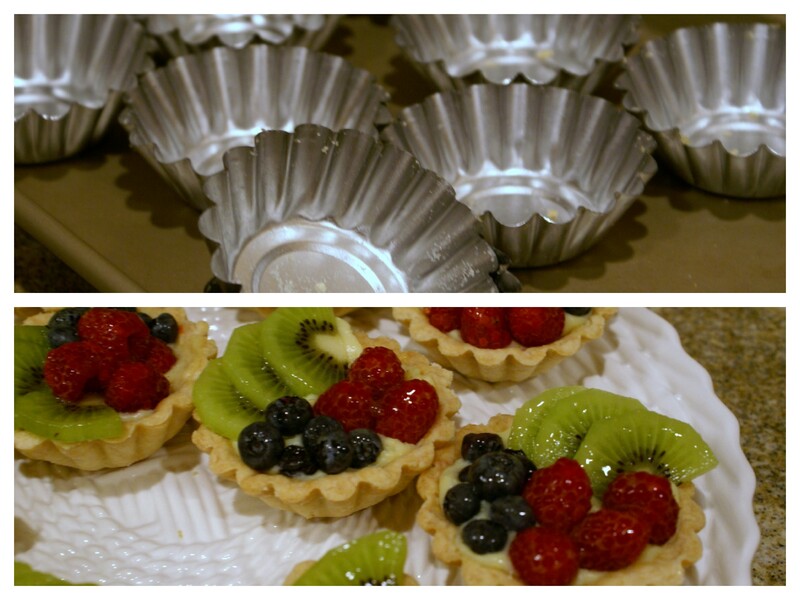 There are a gazillion recipes for fruit tart out there, which basically consist of a crust, filling, fruit, and glaze. My main gripe with most fruit tart recipes has always been the bother of chilling, then rolling out a crust. I have finally found a crust that skips those finicky steps and gets right to business. Below is my version of this much-loved dessert! 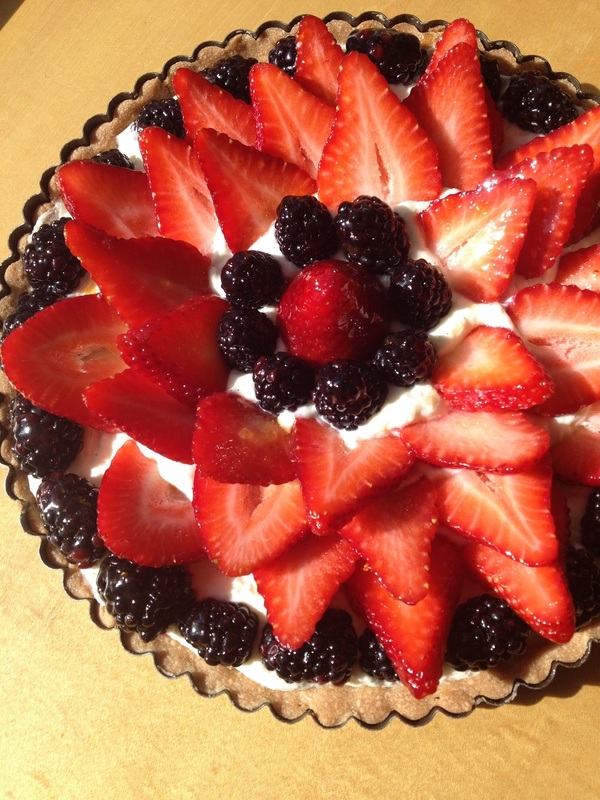 As for the “Gorgeous” in “Gorgeous Fruit Tart,” that’s actually totally up to you. Pick a nice combination of fruits that have contrasting colors, then slice and arrange them neatly. Look online for inspiration. For the crust: Preheat oven to 350 degrees F. In a stand mixer, combine the powdered sugar, flour, and butter until it forms a ball. Press into a fluted tart pan with a removable bottom, then bake for 12-15 minutes until lightly browned. Let cool. For the filling: In a heavy saucepan, stir together the milk and 1/4 cup of sugar. Bring to a boil over medium heat. In a medium bowl, whisk together the egg yolks and egg. Stir together the remaining 1/3 cup sugar and cornstarch, then stir into the eggs until smooth. When the milk comes to a boil, drizzle it into the bowl in a thin stream while whisking so that you do not cook the eggs. Return the mixture to the saucepan, and slowly bring to a boil, stirring constantly so the eggs don’t curdle or scorch on the bottom. Optional: To make your filling lighter and airier, whip cream to peaks in a separate bowl, then fold into cooled (but not totally chilled) filling recipe above. For the glaze: In a saucepan, heat apricot preserves with water until liquid. Strain to get chunks out. Use while still warm. Assembly: Scrape the filling into the crust, smoothing out the top with a spatula. Arrange fruit neatly in concentric circles on top of the filling, then brush with a thin layer of glaze using a pastry brush. Take pictures and feel proud of yourself. Refrigerate until ready to serve. Also see my post on ideas for using up your leftover egg whites. Yes! Now you know :).